I have been working off and on since Sept. 2015 with a particular way of analyzing Isaiah in the Book of Mormon using a couple of spreadsheets. Using this method, I discovered some patterns that reveal some impressive things about the text. Identifying every single Isaiah reference in the Book of Mormon. Comparing the Book of Mormon references to Avraham Gileadi’s 7-part literary structure. Examining where these Book of Mormon references fall within the structure of Isaiah’s books and Avraham Gileadi’s 7-part literary structure. Exploring how the 7-part structure themes flow through the narrative of the Book of Mormon. There is a chiasm involving the names of the people that quote Isaiah that clusters around the chapters related to salvation and loyalty themes. Nephi is the only one that quotes from the negative themes (the first 33 chapters of Isaiah’s 66 chapters). Nephi and Jacob initially focus on the positive themes and then Nephi switches almost exclusively to the negative themes. The small plates of Nephi contrast 6 of the 7 negative themes with the salvation and loyalty themes. People in Mormon’s abridgment, namely Abinadi, Jesus, and Moroni, quote exclusively from the salvation themes. This is the first of 6 videos that are being done for the Isaiah Institute and Avraham Gileadi. He hasn’t allowed embedding on these videos so just click the graphic below. I thought these were pretty well done and if you will take 18 minutes and just sit and watch this video, I think it will cause you to see Isaiah in a dramatic new light and perhaps encourage you to understand it better and dig deeper. All of the verses are from Avraham Gileadi’s translation of Isaiah. I might have picked different images for some of the verses, but hey, that’s scripture for you, we all see something a little different. The overall message and the way it is presented is unique and worth checking out. Two Awesome Isaiah Seminars with Avraham Gileadi are Coming to Vegas! I really like the work of Avraham Gileadi and I think it is very important to helping understand and search the words of Isaiah as Jesus commanded (3 Nephi 23:1, 3 Nephi 20:11). I’m a big fan of Avraham Gileadi’s work on the Book of Isaiah. We’ve all been put here on the earth for a purpose and to do great things, especially here in the last days. 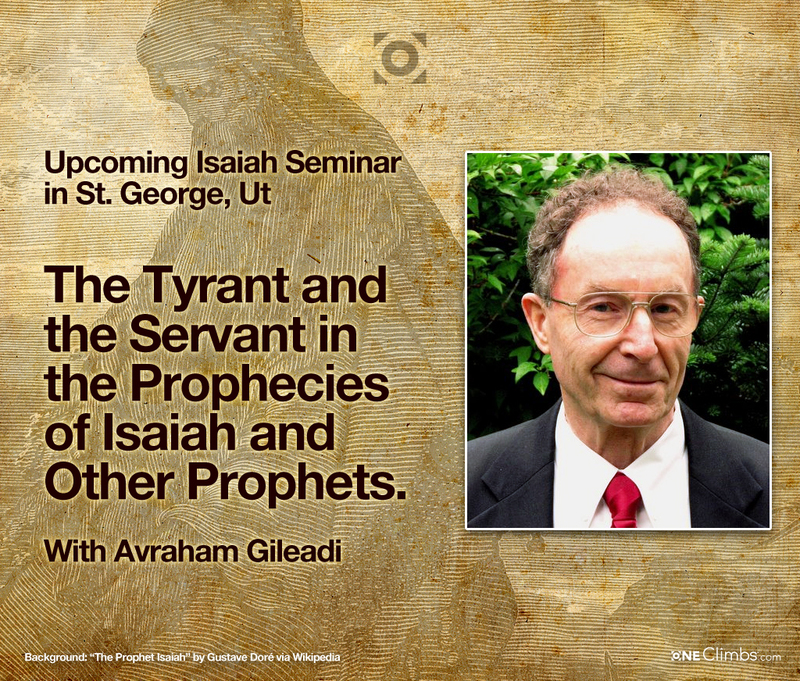 I think that it is likely that Gileadi was inspired to help amplify Isaiah’s message to world at this important time. Having attempted over the years to correct erroneous statements about me that others have made under my name on Wikipedia—only to have them intentionally or non-intentionally replaced by the same ones as before—I feel constrained to clarify several things in regard to myself for the benefit of those who might otherwise be prejudiced toward my life’s work on the Book of Isaiah. First, although I am a Hebrew scholar and literary analyst, I was never a “Mormon historian” or “researcher of Mormonism,” considering the literary analysis of the writings of Isaiah and their scriptural connections of themselves worthy of a life’s commitment. Second, as I taught college at Brigham Young University by way of supporting my family only during my academic years (1973–1981), I was never “terminated” as either a teacher or professor. I thus can’t be considered to have a “post-termination career.” Third, although I was excommunicated in 1993 from the LDS church in a disciplinary council that began a wave of several thousand excommunications on the Wasatch Front in the 1990s, in my case—as not a single charge was true or supported by evidence—all record of it was expunged from the church’s records nearly a decade ago in a tacit admission that the church had made a mistake. In other words, as my excommunication from the church was a non-event so far as the church is concerned, it doesn’t define me as a person. Yet there are those who take it on themselves to define me as such throughout the current Wikipedia article, attaching it even to my listed name. Fourth, while several prominent writers who were excommunicated in 1993 pleaded their cause in the media at that time and thus embarrassed the church, I never did so, even though my family, reputation, work, etc. were adversely affected by the church’s action. Yet those same prominent writers were evidently glad to see me among their number and to ascribe to me the very same questioning of the church’s authority and “speaking against church doctrine or leadership” in which they engaged, as the current Wikipedia write-up asserts. As I have never been asked to change my conclusions that derive from applying several methodologies of literary analysis to researching scriptural texts, my supposedly “challenging the exclusive right of leaders to define doctrine” is a non sequitur. In short, the above writers have no evidence of any such spurious claims and I ask them to desist from their calumnies. As in this instance, the abject practice of citing anti-Mormon sources to supply the “truth” or of defaming the messenger whose findings happen not to coincide with your opinion is further unbecoming of Wikipedia, whose goal is to convey information to the world, not misinformation. Fifth, I appeal to anyone who studies the contributions I have made over many years of researching the Book of Isaiah to check out for himself the scriptural evidence I present instead of depending on hearsay, preconceived ideas, or popular opinion. A major part of the opposition I have received (though I confess I have caused some by my own follies) has been the nature of Isaiah’s message itself. Because to certain defenders of religious orthodoxy Isaiah’s message has seemed controversial, therefore by them I have been deemed controversial. Admittedly, Isaiah’s paradigm of end-time realities, while terribly indicting of those who profess to be God’s covenant people in that day, also holds out hope for those who dare to search their souls and let go of all things materialistic and ungodly. And as a new paradigm that is grounded in the truth of God inevitably wins out in the end, so the prospect exists that Isaiah’s message to the world will ultimately bear good fruit.